Electromagnetic induction is the phenomenon of the mutual coupling of the magnetic and electric fields, where the electric field is generated whenever a time varying magnetic field is present. 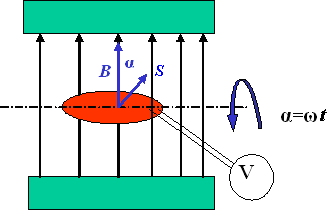 For example, in the introductory experiment in the picture above there is a bar magnet moving in the direction of the winding and thus creating the time dependent magnetic field. We can observe the deviation on the connected measuring instrument. This deviation is caused by the time dependent electric field in the coil. This phenomenon is called electromagnetic induction. Electromagnetic induction is used for example in dynamos or alternators, which are the devices for transforming mechanical energy into electrical one. For the quantitative description of the experiment we need to introduce a few physical quantities and symbols. the change of a mutual orientation of vectors B and dS, α(t). We will use in our experiment the third component (rotating coil in the homogeneous magnetic field, Fig. 2). In this particular experiment we will use the arrangement from the Fig. 2 in which a flat coil of area S rotates around the fixed axis, which lies in the coil plane, in a homogeneous magnetic field with the magnetic induction B. Integrating the previous equation (5) we have an important condition that should be fulfilled if the Faraday s law is valid.